Why is the concept of the Messiah so greatly misunderstood? Vic Batista: We are working through Isaiah 53, and now we are on to verse 6 and on. Can you continue to open these Scriptures up to us, because it is apparent here that the Bible is saying that every one of us has turned from God and that none of us are actually following Him? As you are expounding on this Scripture, could you continue to take us through these verses? Nathan Jones: We read in verse five that the Messiah would be pierced for our transgressions, in other words, our sins. He would be beaten and flogged, and then crucified and mocked. He did that for us! The reason Jesus did that for us is because it says in verse 6, "We all like sheep have gone astray, each of us has turned to our own way, and the Lord has laid on Him [Jesus] the iniquity [sin] of us all." People are like sheep. Sheep wander all over the place and so they need a sheep dog and a shepherd to keep them all wrangled up. That in truth is how humanity behaves. We don't stay with the Shepherd. The Shepherd loves the sheep and He takes care of the sheep. But, we as humans want to do our own thing. We want to go our own way. When we do so that puts us in danger of the wolves and the lions trying to eat and kill us. So, the Good Shepherd wants to bring us back to safety so that we can grow in that spiritual relationship with Him. Vic Batista: Sheep are not the smartest animals, right? Nathan Jones: You've got to wonder if God wasn't putting a little commentary in there when He compared mankind to sheep. But, yes, sheep are not smart. They are the only animals that have no self-defense whatsoever. They are 100% dependent on people to defend them. That is a great example of people, don't you think? We think we are tough and we can handle ourselves, but then a little trouble comes in our lives and we realize, what?" I can't handle this!" That's usually when we call out to God for help. Vic Batista: Isn't it awesome that's how God wants us to depend on Him and not on our own strength? We've never seen a sheep doing kung-fu, or any other self-defense. Nathan Jones: Wow, what a picture, that's great! A kung-fu sheep! Vic Batista: You made a good point in that sheep don't have any defensive system. They are totally dependent on their shepherd. Likewise, Jesus Christ is our Guide and our Great Shepherd. 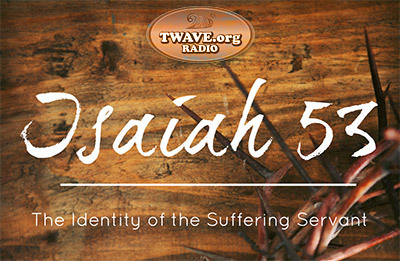 Vic Batista: Nathan, I really love Isaiah 53 because there's so much there to study. As you are taking us through this passage, I notice verses 7-9 are talking about a person who is afflicted, and not a nation. Nathan Jones: Exactly, it is "He" singular. The Suffering Servant it not a representation of a people group or anything beyond one person. Definitely it's a Messianic passage, and Isaiah wrote many Messianic passages. When Jesus came at the First Coming, the Sanhedrin who were the ruling teachers of the law, they looked back to the prophets to understand what the Messiah would be like. They then judged Jesus as not qualifying because they hadn't seen Him crucified yet. Even Jesus' own half-brothers had rejected Him because they didn't see Him as the Messiah. Actually, they thought their half-brother was a nut! Then Jesus suffered, just like Isaiah 53 prophesied, and Jesus rose from the dead, and that made them realize, "Oh, Jesus is the true Messiah!" We now have the benefit of looking back and realizing that Jesus Christ fulfilled every one of these verses perfectly and in incredible detail. Vic Batista: That is why I love the Word of God and Bible prophecy. I really encourage people to take the time to dig through the Word of God and allow the Holy Spirit to show you the truth in the Word. Here again in Isaiah 53, this is an incredible passage and clearly it is talking about an individual for, as we see often times, it is talking about a he. I really believe this is a chapter where not enough people take the time to study the prophecy of the Suffering Servant. Vic Batista: Why again is it that the Jewish people don't see Isaiah 53 as talking about an individual? Nathan Jones: The Jewish view of the Messiah is interesting. Theirs is two-fold, for they don't believe in just one Messiah. The Orthodox Jews actually believe in two Messiah's. One Messiah the religious Jews believe will be an average person whom the Holy Spirit will come upon, kind of like Samson. Samson would get in a bind and so then the Holy Spirit would come on Samson and he would become very strong and he would lead the Israelites into victory. That is the type of Messiah the Jewish people are looking for even today. They think that it could be any guy whom the Holy Spirit comes upon and who will lead them to victory against their enemies. That is not the Messiah that the Bible is talking about though. The Messiah that is being described here in Isaiah 53 is a spiritual Messiah. It is God Himself who would come down and rescue His people. And, He will. There is a seven-year Tribulation coming upon the world, and the prophets reveal that only a third of the Jewish people will be left by the end of that trouble. Tragically, another holocaust is coming. When Jesus the Messiah comes at His Second Coming, Matthew 5 says they will look on Him whom they have pierced and weep and wail and mourn because they will realize that Jesus is the Messiah they'd rejected. Their people had missed Him 2,000 years ago. The spiritual blinders are on most of the Jewish people today, and so they won't understand who the Messiah is until Jesus actually comes back. Vic Batista: Excellent point! That's why the Bible tells us in Daniel 9 that a great deceiver will come and the Jewish people will instead follow him. Nathan Jones: Yes, Daniel is talking about the Antichrist, the one-world leader who will make a 7-year treaty with Israel. He will grant them seven years of protection, but 3.5 years into it he will break his covenant with them. He will desecrate the newly built Third Temple, and that's when they realize that he's a false messiah. The Lord has not given up on the Jewish people, though. He has made promises to the Jewish people that a remnant of them will come to know Jesus as Messiah and Savior. There's a lot that's coming ahead in Bible prophecy that the Jews are going to have to endure before Jesus returns. But, in the end, the remnant of Jews who remain — a third of them — will accept Jesus as Savior. There's a lot of tragedy that still lies ahead in Bible prophecy that the Jews will have to endure before Jesus returns, but praise God a remnant of them will accept Jesus as Savior. Vic Batista: There is that hope. But, in the meantime, we see that the Jewish people are still blinded like so many people are to the truth of the Gospel. Not only are the Jews, but anyone who does not trust in Jesus Christ as their Savior. Gentiles are just as blind. Nathan Jones: Right, spiritual blindness is not just a condition for the Jews; it is afflicting the Gentiles as well. This is the Age of the Gentiles, and during this time the Lord has given us the Gospel. The Gentiles are primarily sharing Christ's message of salvation, though there are a growing population of Messianic Jews. But, this age will be coming soon to an end, and then the Tribulation comes, and both Jew and Gentile will have to deal with the fact of Jesus Christ. God's focus though will be back on the Jewish people, bringing them to the saving knowledge of Jesus the Messiah. In the eighth part of our study of Isaiah 53 and the Suffering Servant, Vic and I will continue to look into the life of the Messiah as one who was silent before His slaughter.